As per our previous post on the Bmx Gallery 4130 Ride to Glory contest, read on for the full task sheet. Stay fully up to date on the contest on Gallery’s site here. This is the basic Task & Challenge sheet for everyone. Get all or as many as you can checked off and add up the points. Keep track of your score as you must have this total when you hand it in. We will choose who wins the bonus pts and add them to the score. If your are also doing the 18 Plus Challenges you will need to email us at info@bmxgallery.ca to get it. The Top 3 teams placed in both 18 Under and 18 Over will each win a prize pack. Separate prizes for bonus challenges will also be won. Good luck to everyone, and be sure to check out the rules in the post below ! The following Contest Challenges win a separate prizes TBA and 100 Bonus Points ! RollerCoaster Grind all 4 pegs at once ! 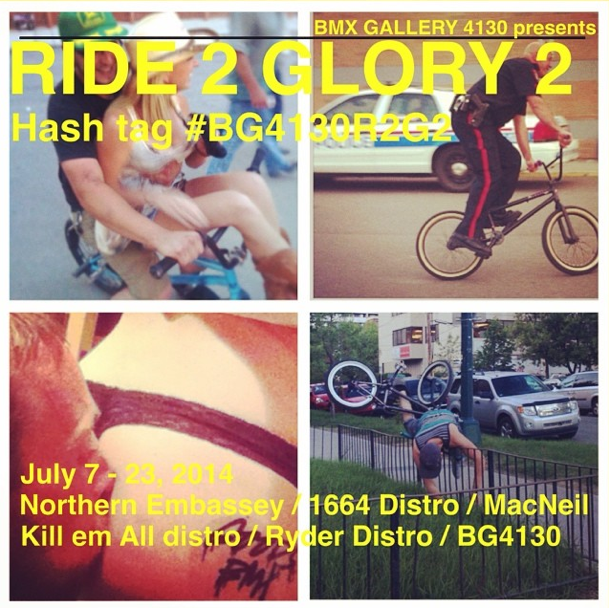 Follow Macneilbikes, 1664bmx, Northernembassy, Gallery4130, Ryderbmx, Killemalldistro on Insta. Wear short shorts for a week. Let’s see those pockets ! Hang 5 out of something and back In.